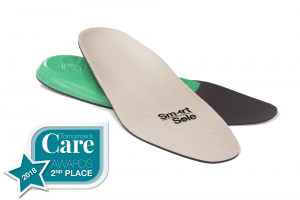 We are delighted to to announce that the GPS SmartSole from Possum has won second place in the ‘Tomorrow’s Care’ Awards 2018! Possum are proud to be the exclusive sole distributor for the GPS SmartSole® product from GTX Corp in the UK and EIRE. GPS SmartSole® is a GPS tracker placed discreetly inside a shoe insole. It uses the same GPS and cellular technology as a smartphone, is charged like a phone, and requires activation and a data service plan. Like a phone, it works cross country within cellular network covered areas. The location is updated every ten minutes and it is an effective solution to maintain a user’s independence and safety. It is ideal for those who have a loved one living with Dementia, providing peace of mind in a discreet and comfortable way.